It takes a lot to drag cuisine lovers out of their comfort zones and steer them toward venues far from the central districts, but sometimes that long Uber ride across town is richly rewarded. This is one of those times and places— out in one of the more featureless corners of District 11, Sky Garden BBQ (624 Lac Long Quan, W5, D11) is an outdoor restaurant occupying an alley between two adjacent towers that has one of the most unique menus in the city. It has recently become the top importer in the market of giant live lobsters from Canada and northern Europe (Norway and Sweden), along with enormous Alaskan crabs that make challenging meals for even the most ardent seafood fanatics. While the restaurant as been quietly popular with local residents for a number of years already, the arrival of these oversized crustaceans on the menu has given the venue a sudden spike in popularity, along with repeated media coverage and a number of viral video clips online that in some cases have attracted millions of views. At the center of the hype is founder Lanh Nguyen, who has been running the restaurant as a pleasant rooftop seafood barbeque in the building next door since around 2013. At some point last year, a bizarre standoff with the building’s owner prompted the relocation of Sky Garden downstairs and resolved with Lanh operating both spaces—he promptly rebranded his rooftop as a pizzeria (Royal Pizza), and set about making both restaurants completely lobster-centric. He now imports a hundred kilograms of live giant lobsters and 400 kilos of frozen lobster a week (that’s two metric tons of lobster per month) and while he does supply a number of other restaurants around town, he keeps a tank of the biggest and best alive at his restaurant for serving his own customers, many of whom have never seen such monsters—let alone had the opportunity to hold them up for selfies. 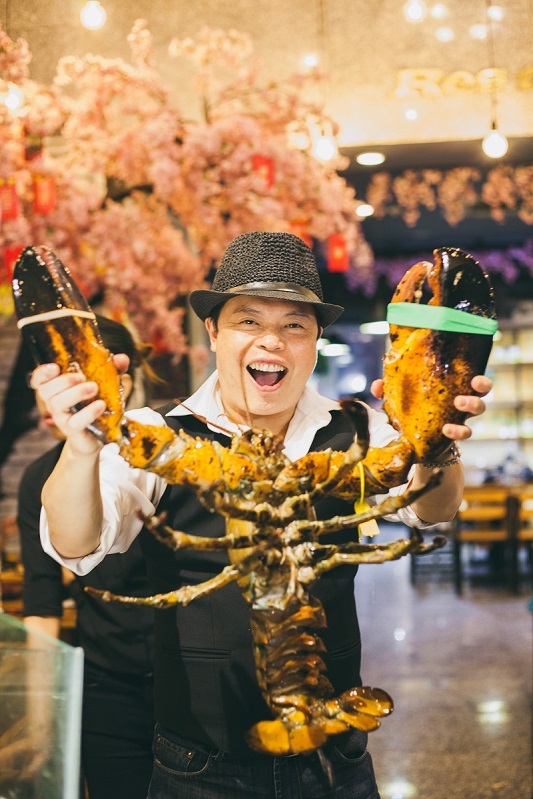 While originally conceived of as a way to bring premium lobsters to local diners at affordable prices, his unexpected popularity has started to see curious foreigners, VIPs and celebrities hunting down the venue too to find out what all the fuss is about. Selecting a lobster for your evening meal at Sky Garden is a performance in itself—once the obligatory photographs are staged, the beast is weighed pricing is at VND1.9 million/kg) and brought to the table to scuttle across its last destination on Earth. He (“she” if you’re lucky—the females carry roe and are more delicious, but most are thrown back into the sea by the fishermen) will become a four-course meal, the first of which is a one-of-a-kind take on a traditional Vietnamese blood soup. As in the conventional recipe which uses fresh pork blood, the animal is completely drained (you may need to look away) into a bowl of herbs and prawns, which is then left for several minutes to congeal. The resultant light jelly is mildly salty and unexpectedly delicious; for now, this is the only venue in the country where you’ll find the dish. While you’re tasting the soup, the quivering lobster is withdrawn to be made presentable for its second act, returning on a platter with the tail meat sliced into strips and arranged around the shell on ice as sashimi. SkyGarden insists you try a slice on its own before carrying on with the ginger and wasabi, just so you can appreciate the unembellished flavors of what is a rare treat in Vietnam. The claws and arms seem to take up half the basket; they’re removed and returned 15 minutes later deep-fried in butter and garlic. With the shell now broken, it’s clear just how massive this creature is; each claw is a meal in itself, breaking nicely into steaming chunks and best dipped in Vietnamese green chili lime sauce. 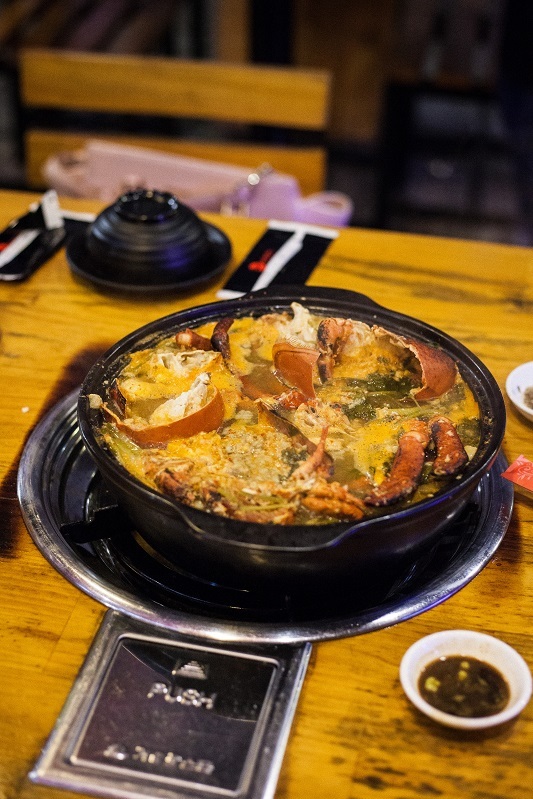 This isn’t the last of the lobster, however—once you’re through, all the remaining slivers of meat will join the head in a steaming hot pot with a chicken bone broth, in which the remaining blood soup foams like a savory tofu and all the herbs and spices gather together for a fitting final farewell. It’s worth mentioning here the restaurant’s own craft beer “Dzo”, as thisis your most appropriate accompaniment to the lavish meal. Dzo is a very malty, easy-to-drink brew that is probably the cheapest craft beer in the city at just VND100,000 for a huge bierstiefel yard glass. 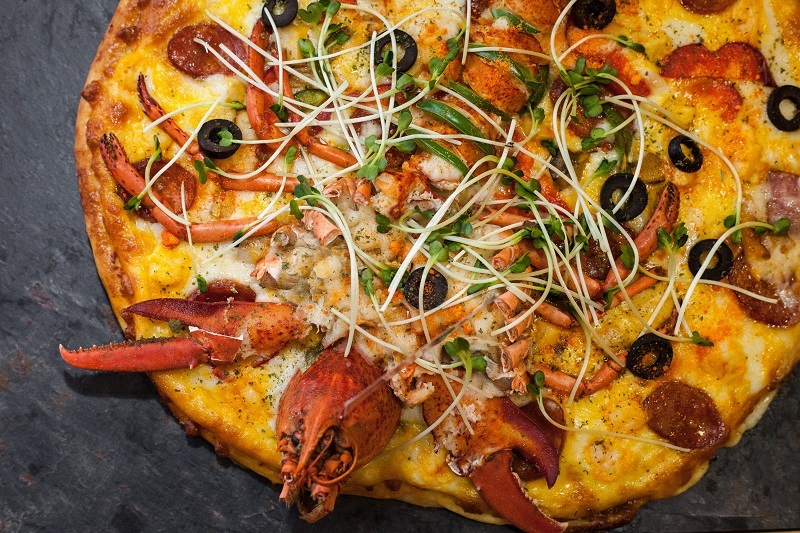 For the purposes of this review, we also tried Sky Garden’s half-kilo lobster pizza (VND495,000). For the record, ordering both the pizza and the live lobster isn’t recommended unless you have enough people to help you get through the evening—but that being said, you must take it from me that you cannot miss this pizza. None of the popular pizza chains are doing what Sky Garden/Royal Pizza do with their whole-lobster pizza pies—served on a black Vietnamese hot stone tray, these pizzas stay hot and crispy for an hour, and the quality of the cheese is so good you’ll need to reconsider whether or not this is really too far to come across town for. You left out Vermont. The Anchor Seafood Restaurant in Wilmington, Vermont has great lobster rolls. And I know you are going to disagree with this, but: in my neighborhood in Glendale, Queens, NYC, the local Stop & Shop has lobster rolls all year long for $8.99. We all know the lobster meat is thawed out from being frozen. But they still give you a claw and piece of tail. It”s great comfort in the dead of winter.